Photo: Salish Eye owner Tricia Thomas. A Coast Salish digital design company has opened the doors of a new studio space at Halalt First Nation. 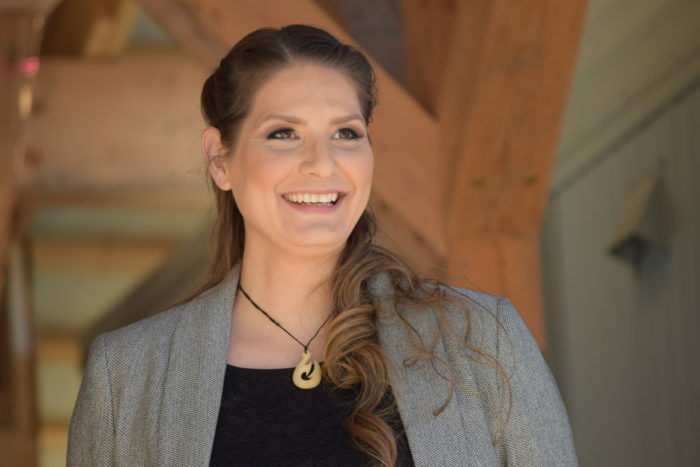 Salish Eye Productions is owned by Halalt member Tricia Thomas (Laxelewetstnaat) and offers photography, videography, website design and more. The company’s new studio officially opened in the community near Chemainus, B.C., with a celebration on March 10. It’s the culmination of about five years of planning for Salish Eye, which previously had no fixed studio space. “This (studio) is a place to document history, culture, language and showcase artwork,” Thomas said. The building includes a recording studio to document songs and stories, a photography and videography studio and a community gathering space. Thomas said the new studio will also be open for meetings, workshops and events, starting with an Indigenous entrepreneur workshop through the University of Victoria that she’s facilitating later this Spring. Later, she hopes to host language revitalization events, traditional medicine workshops and more. “People can get together (here) to support each other and enrich each other’s lives,” she said. It’s a particularly impactful moment for Thomas, whose dreams were almost thwarted by two serious car accidents in 2014, one of which happened just before her first big job with Salish Eye. Though the accident was life-altering, Thomas said she found a silver lining while she was in recovery. “I think it allowed me the opportunity to plan better,” she said. Her partner Isaac Jack did a lot of the heavy lifting behind the scenes, building almost the entire studio through his company Salish Coast Contracting. During the opening celebration for the studio, Snuneymuxw dance group Footprints of the Wolf sang the Women’s Song to honour Thomas. There was also a fashion show from Snuneymuxw’s Ay Lelum Good House of Design featuring designs that Thomas has worn or photographed. The display included Ay Lelum’s “Salish Eye” dress, which Thomas wore when she accepted a Young Entrepreneur of the Year award at the B.C. Achievement Foundation’s Aboriginal Business Awards in 2017. Pat Thomas, Halalt councillor and Tricia’s mother, said the studio’s opening was a proud day for herself and the nation as a whole. “Having a vision five years ago and having it come to fruition is absolutely amazing,” she said. More information about Salish Eye Productions can be found at www.salisheye.com.